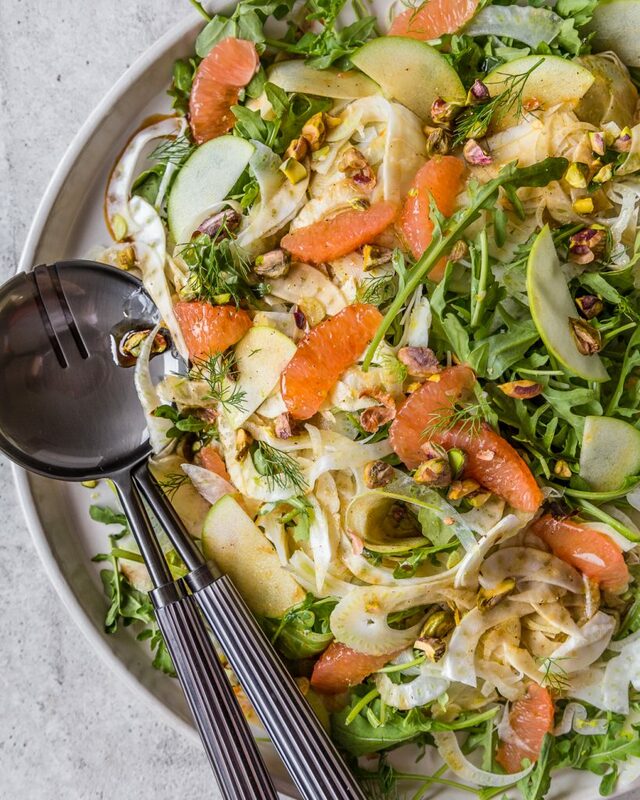 This Whole30 Fennel, Arugula and Grapefruit salad is easy, delicious and very pretty, if I do say so myself. In other words, it’s a great idea for a Mother’s Day lunch, brunch or even dinner. If your family is more keen on going out for a celebratory meal, that’s cool too. But there is something extra special about preparing a meal for the most important woman in your life. I mean, it’s the least you can do for the person who gave birth to you! 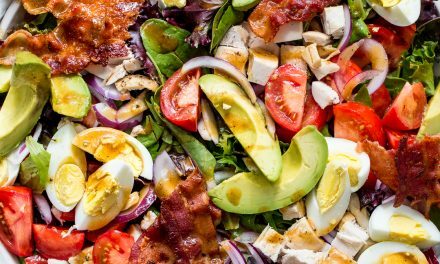 Personally, I like to serve this salad alongside a simply-prepared lean protein such as grilled chicken or fish. See, for example, this Fennel Salad with Marlin. 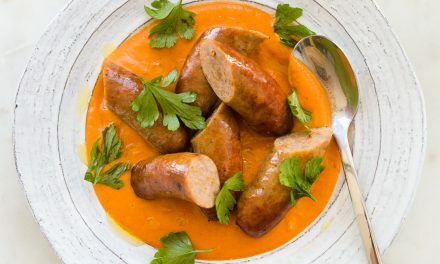 It would also go great with some hard boiled eggs if you’re looking to have it for a light, brunch-type situation. 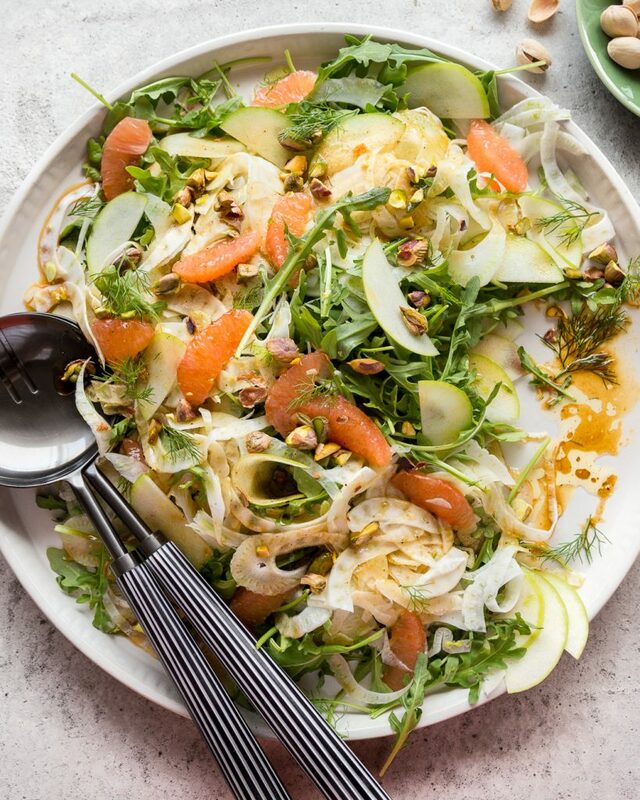 The fennel is crisp, the arugula adds some peppery bite, the ruby red grapefruit lends some sweetness and acidity to the dish and the apple gives a subtle and unexpected crunch. 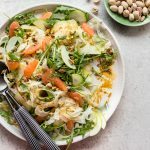 Everything gets dressed in a very simple vinaigrette before being topped with crushed pistachios for a bit of texture and flavour! If allergic to nuts, feel free to substitute your favourite toasted seeds (such as pepitas or sunflower). 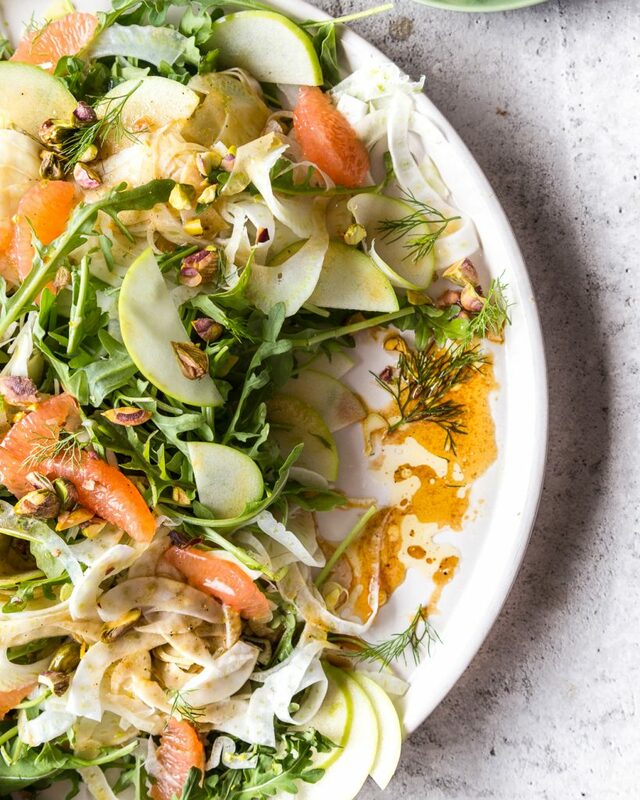 If you’re new to fennel, this salad is a great way to get your feet wet, so to speak. Fennel has a very mild and sweet anise flavour (think black liquorice) that is delicious both raw and cooked. 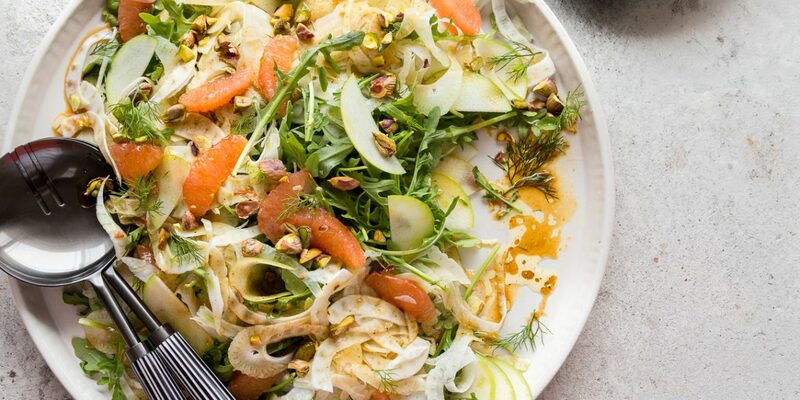 For a similar version of this salad, albeit with roasted fennel, see this recipe here. Fennel is fairly fibrous so the secret to eating it raw is to finely slice or shave it. The best tool for the job is a Japanese Mandoline. I always recommend this Benriner model, which can be found on Amazon for a good price. As always, I solicit this kitchen tool with a word of warning: BE CAREFUL! This is likely the sharpest blade in your kitchen and most people underestimate how dangerous a tool a mandoline can be. You can purchase a pair of Cut Resistant Gloves to prevent injury, or use the included safety guard that comes with the mandoline. 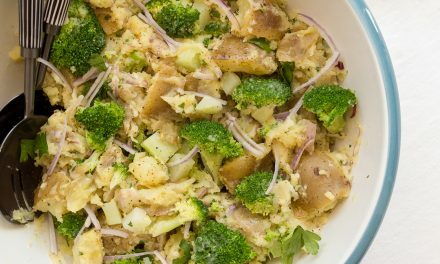 Add fennel and arugula to a large mixing bowl. Add EVOO, grapefruit juice, balsamic glaze and a tiny pinch of salt and pepper to a small mixing bowl. Whisk vigorously to combine. Taste for seasoning and adjust salt and pepper as required. Note: this vinaigrette lacks an emulsifier so it is normal for the dressing to separate if set aside. 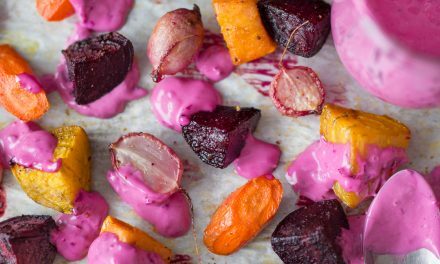 Pour vinaigrette overtop of salad and gently toss everything to coat. Transfer salad to serving platter and garnish with reserved fennel fronds, grapefruit segments, apple and pistachios. Serve on its own or alongside a lean protein of choice.